OEM version of the LSI SAS 9211-8i, such as the Dell H200, H310 or IBM M1015 are quite popular for use with FreeNAS. However, they need to be flashed with a regular LSI firmware to disable their RAID capabilities in order to passthrough the drives directly to the OS. Here’s how I upgraded my Dell PERC H200, which came with Dell’s A10 firmware (equivalent to LSI SAS 2008 P07 firmware), to LSI P20 firmware. The newer version also has the advantage that drives larger than 2TB are supported. 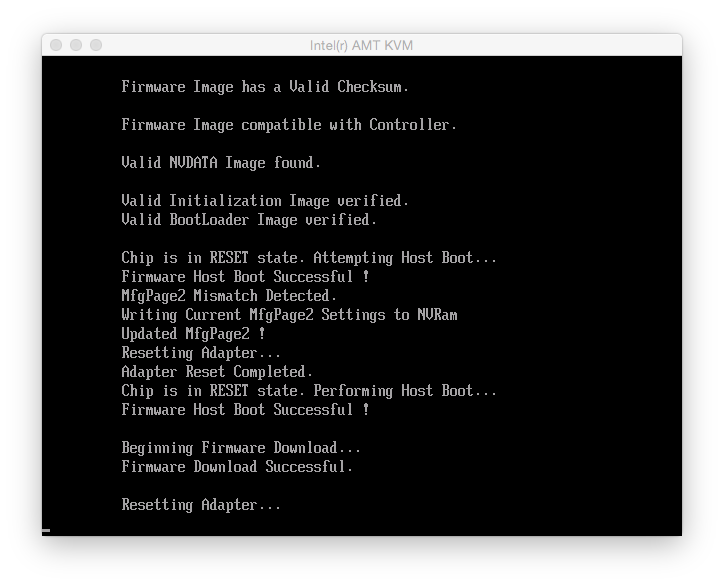 Also, re-flashing allowed me to not flash a boot ROM to the card, speeding up the boot process of my server as my boot disk is connected to the Intel AHCI controller on the mainboard. Please note that this operation is not supported by Dell or LSI, may void your warranty and could potentially damage the controller. So proceed at your own risk. Download the firmware for the Dell 6Gbps SAS HBA (this is a variant of the H200 with 8 external ports instead of 8 internal ports) and extract 6GBPSAS.FW from SASHBA_Firmware_6GBPS-SAS-HBA_07.03.06.00_A10_ZPE.exe. Download the P07 firmware for the LSI SAS 9211-8i and extract the file 2118it.bin from 9211_8i_Package_For_P7_Firmware_BIOS_Upgrade_on_MSDOS_and_Windows.zip. Download the P05 UEFI flasher for the LSI SAS 9211-8i and extract the file sas2flash.efi from EFI_Installer_P5.zip. Place these three files into a directory named P07 on a FAT32-formatted USB flash drive. Download the current firmware for the LSI SAS 9211-8i and extract the file 2118it.bin from 9211_8i_Package_P20_IR_IT_Firmware_BIOS_for_MSDOS_Windows. Download the current UEFI flasher for the LSI SAS 9211-8i and extract the file sas2flash.efi from Installer_P20_for_UEFI.zip. Place these two files into a directory named P20 on the USB flash drive. Download an x86_64 UEFI shell. I had to use the v1 shell because my server would only show error messages (about failed assertions and files not found). Rename the shell to BOOTX64.efi and place it into a directory named BOOT inside a directory named EFI on the USB flash drive. 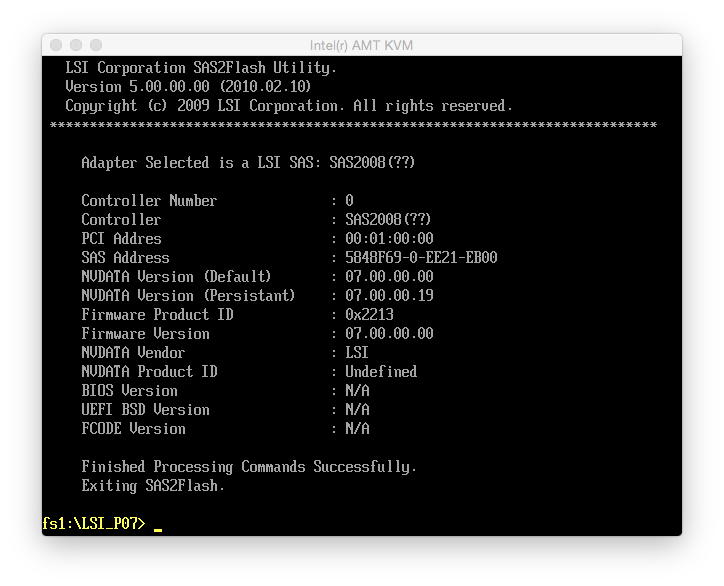 sas2flash.efi -c 0 -list shows you details on the controller. Note down the SAS address in case something goes wrong and you need to reprogram the SAS address. 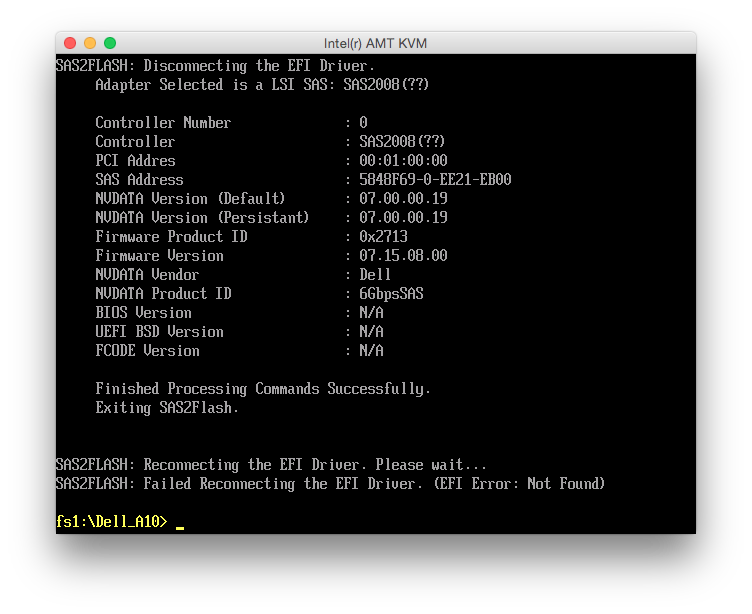 At the end of every command (before I rebooted before step 10), I got the message “Failed Reconnecting the EFI Driver. (EFI Error: Not Found)”. It did not seem to affect anything. Step 7 showed “Erasing Flash Region” and then after a while “ERROR: Erase Flash Operation Failed!”. I simply proceeded and the error did not appear to affect anything. Booting up the server, I now had a Dell H200 that behaved exactly like a LSI SAS 9211-8i. The only difference was that it still reported its name and PCI ID (1028:1f1c) as a Dell 6Gbps SAS Card. FreeNAS didn’t care about that though. In this case, I had no data loss whatsoever and the person who reported this on the FreeBSD mailing list didn’t either, but both LSI and FreeBSD recommend to keep driver and firmware in sync. As I had to downgrade the firmware, I needed to do sas2flash.efi -o -e 6 before the flashing. Of course, this means that the crossflashing is undone and you’ll have to start over, flashing Dell 6GPBSAS.FW, flashing LSI P07 IT, and finally flashing the version matching your driver. 6GBPSAS.FW and LSI P07 need to be flashed with the LSI P05 sas2flash.efi because later versions will simply refuse when they encounter a NVDATA mismatch. 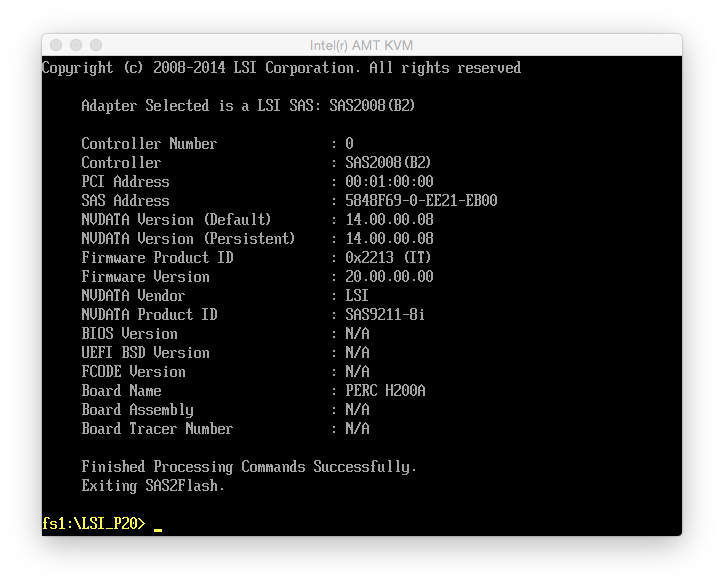 Once that’s done, you can use the latest (P20 at the moment) sas2flash.efi to flash your final firmware version. 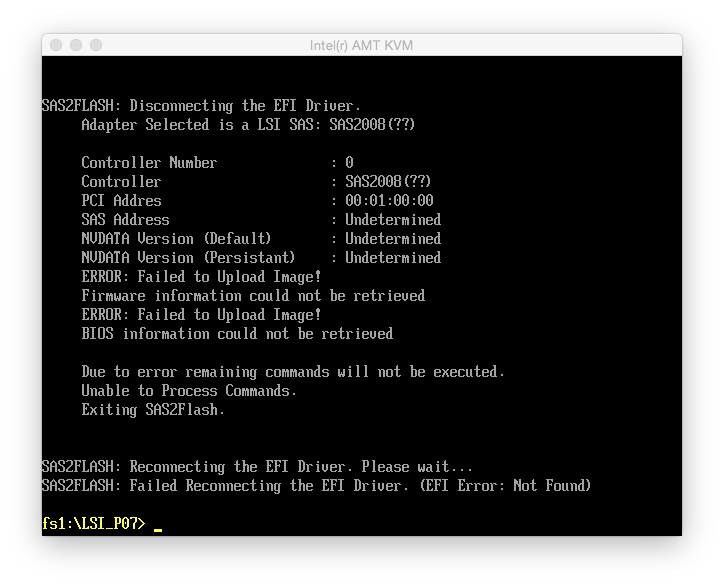 This also has the advantage that you don’t get these “Adapter Reset Failed” warnings. This entry was posted in Linux on 2014-11-29 by Michael Kuron.